By the time a movie is released, you’ve seen previews or read reviews and go to see it with certain expectations. I’m no exception and went to see Hidalgo expecting a story about a man and his horse. I wasn’t disappointed. All controversies about the factual nature of Hidalgo aside, director Joe Johnston, screenwriter John Fusco, and producer Casey Silver brought a great story to life, one with a timely—and for the cowboy—traditional message. 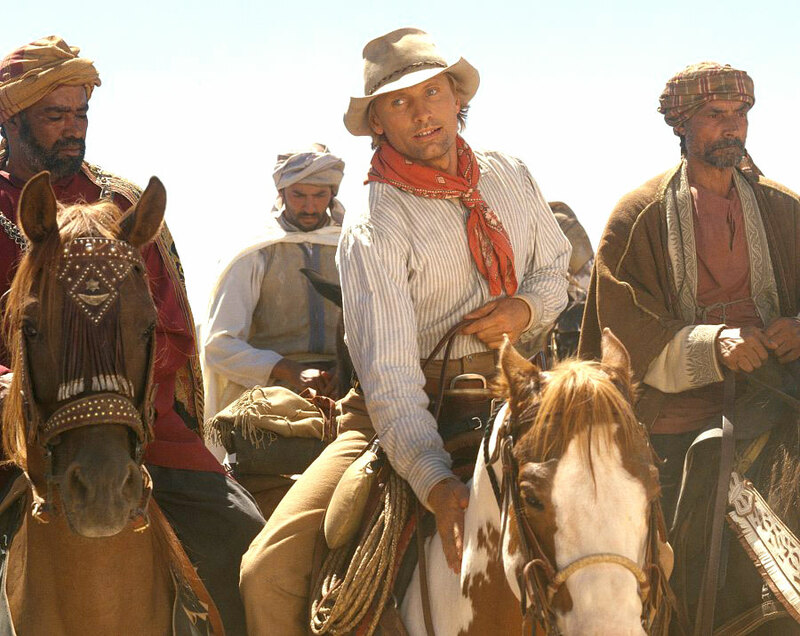 If you don’t know already, Hidalgo stars Viggo Mortensen, Zuleikha Robinson, and Omar Sharif in the story of late 19th-century endurance and dispatch rider Frank T. Hopkins and his Paint Horse—a mustang—Hidalgo, who travel to the Middle East on a quest to win the centuries-old Ocean of Fire, a 3,000-mile horse race across the Arabian Desert. Competitors are traditionally restricted to the purest lines of Arabian horses owned by the country’s wealthiest aristocrats, and when “Cowboy” and his multicolored mustang appear on the scene, the scene is set for the ultimate confrontation between good guys and bad guys; right and wrong. Our first glimpse of Hopkins is a race between him and his “Little Brother,” as he calls Hidalgo, and an endurance ride competitor and his thoroughbred across a Western landscape. Hidalgo overtakes the “purebred” with ease, setting the stage for a theme that will resonate within Hopkins own heart, as he moves from witnessing the slaughter of his Sioux kin at Wounded Knee to work in Buffalo Bill’s Wild West Show, in which he’s compelled to hide his Native heritage from a public with mixed passions towards the Indian: hate or fascination. But beneath the façade of overt decisions rest more profound dilemmas with moral implications: choices between selflessness and survival, between self-exoneration and righteousness; between self-sacrifice and self-aggrandizement. In typical cowboy fashion, without hesitation or long speeches, Hopkins chooses the narrow road and makes his motives clear to those trying to weaken his resolve or make him weak. And then there’s Hopkins’ Sioux heritage. In the process of being a cowboy, Hopkins realizes a new self-respect for who he is: a man with both Indian and white blood flowing in his veins, with no reason to hide either. In conquering the overwhelming odds against him, Hopkins comes to terms with his Indian self, without discarding or devaluing his cowboy heritage, and ends up earning respect, as well as self-respect. Particularly noteworthy is the fact that at no point in his predicaments is Hopkins willing to compromise the bond between him and Hidalgo, and the mustang pony makes no small contribution to the film’s emotional quotient. His own heroics and relationship with Hopkins communicate so clearly to Hopkins—and the audience—that commitment involves self-sacrifice, courage, and conservation of the Cowboy Way. Without revealing the highlights of the plot, let’s just say Hidalgo has his way, but Hopkins is never just following along. He portrays the values of every true cowboy, values intertwined with the heart and soul of his horse and the country he calls home. For the cowboy, right’s always been right, and wrong’s always been wrong, and no matter where or in what time a man lives, that will never change, win or lose. Published March 2004 in American Cowboy online review. Notes: Photo by Richard Cartwright / ©Disney Enterprises Inc. All rights reserved.